The BBS RG-R and BBS F1 Racing are one piece JDM Wheels from the German wheel manufacturer BBS. The BBS RG-R feature an 8 double spoke mesh design and forged ACQ Construction. The BBS F1 Racing feauture a 10 double spoke mesh design in a special gold colorway with red details, also with ACQ forged construction. ACQ is BBS designation for the AirCraft Quality aluminum they use to build the wheels. 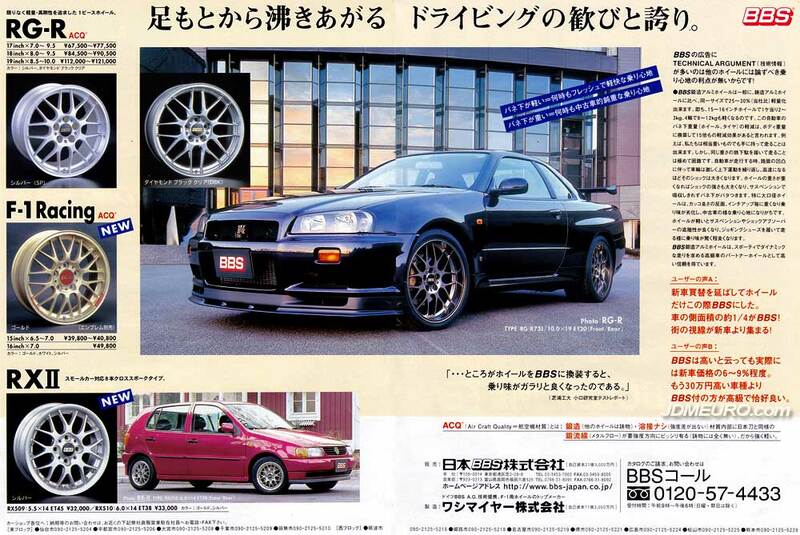 Pictured are the BBS RG-R on a Nissan Skyline GTR R34. Also featured are the BBS RXII.